UNITED NATIONS, August 15, more here – Following up on Inner City Press exclusive publication of UN Development Program audits of its Law and Order Trust Fund Afghanistan, including double payments and other irregularities, whistleblowers have exclusively provided Inner City Press with yet more damning documents. 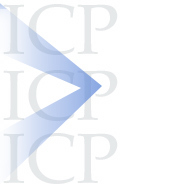 See for now here, here, here and here, exclusively provided to Inner City Press by now-former UNDP staff. There are more documents, one more of which is being published today, here. 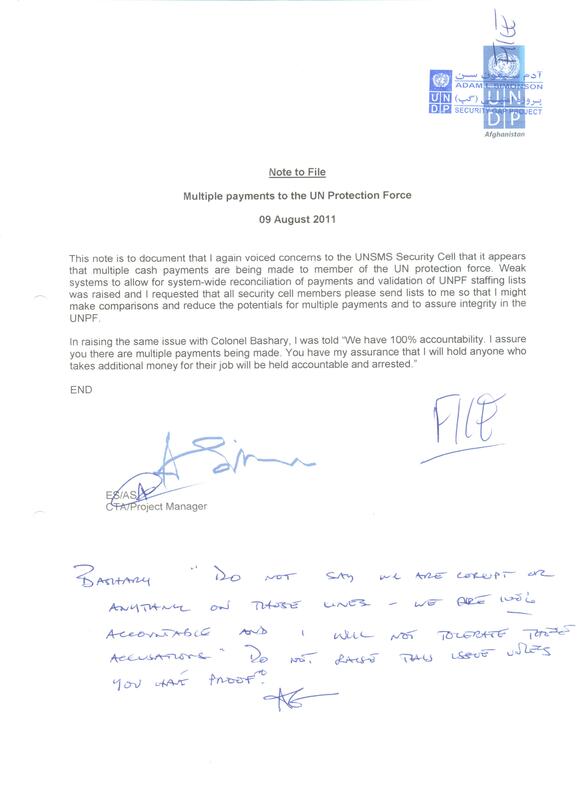 In it, the same Colonel Bashary who threatened he would not tolerate these accusation turns up on the list of double payments. This publication follows four days in which UN spokesman Stephane Dujarric, formerly UNDP's spokesman, has not said whether an audit cited as a justification for not answering is the troubling audit completed in February 2014. This is called stonewalling. And Inner City Press is informed that now "the heat is on at the Kabul office" -- this is called a cover-up, and retaliation against (the wrong) whistleblowers. On August 8, after four days of asking by Inner City Press, UN deputy spokesperson Farhan Haq said "recent allegations concerning Afghanistan have previously been reported to the UNDP Independent Office of Audit and Investigation. In order to avoid jeopardizing the investigation process, the details of investigations are kept confidential and very limited information is made available to offices outside the Office of Audit and Investigation, until the process of gathering relevant evidence and fact-finding has been completed." 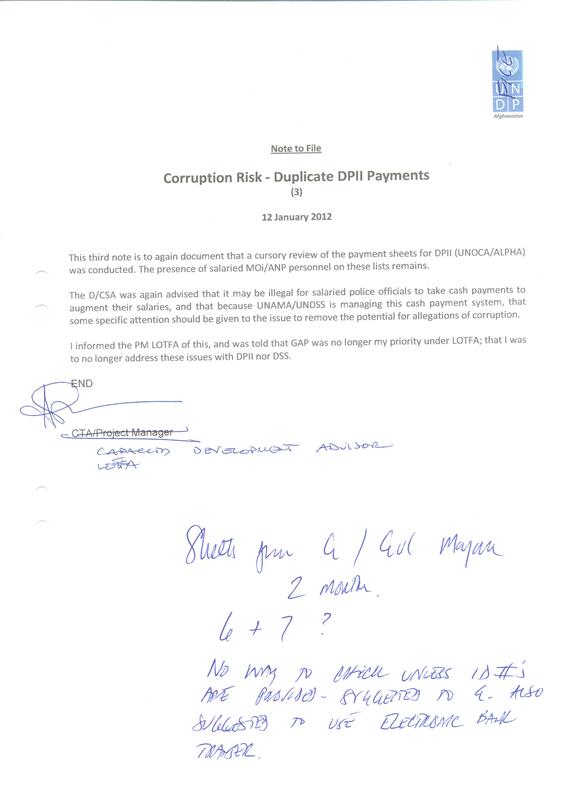 But this UNDP Independent Office of Audit and Investigation COMPLETED an audit of this Closing the Security Gap on February 12, 2014, Report Number 1251, here. five months of 2012; lack of appropriate audit evidence on fuel charges amounting to $60,715 and rent expenses of $13,589; overstatement of indirect program support costs by $21,737." First, it is unacceptable for this UN to say it will not respond to troubling documents because it is conducting its own audit, with no completion date named and no commitment to make it public. The new Free UN Coalition for Access is opposing and seeking to reverse this UN descent into obfuscation and stonewalling. More specifically, was Haq referring to this completed (and troubling) audit, or some NEW audit of the same program? If the latter, how much as paid to Grant Thorton International Ltd for the first audit? Inner City Press: last week there was some back and forth about the UNDP (United Nations Development Programme) programmes in Afghanistan that resulted in Farhan [Haq] on Friday saying that an audit is ongoing, and while the audit is ongoing, there will be no comment. At least that’s how I interpreted it. But, I’ve looked into it and it turns out that there was an audit that was completed of this very program called “Closing the Security Gap” project, finished in February of this year by Grant Thorton. It made a lot of negative findings, but… it wasn’t clear to me, since UNDP never directly answered the questions, is this audit that’s being cited the old audit? Is there a new audit? If there’s a new audit of the same programme, how much was paid for the former audit? And can you explain how it’s appropriate for the Secretariat to not answer questions about DSS [Department of Safety and Security] and UNAMA [United Nations Assistance Mission in Afghanistan] by referring to a UNDP audit that may already be completed? Spokesman Dujarric: My short answer is, show me what you have, what you’re referring to and I’m happy to look into it because I’m a little confused by the number of audits myself. 1) is this the audit Farhan / UNDP were referring to at Friday's noon briefing and justifying not answering questions about DSS and UNAMA? 2) if a second audit of the Closing the Security Gap Project is underway, why? And, either way, how much was paid for the Grant Thorton Audit? 3) This is a requests for the Secretariat to respond to the references to DSS and UNAMA in the documents Farhan was responding to on Friday. Inner City Press: I’d asked you on Monday about this UNDP audit that was cited as a reason they were not answering a questions about [Department of Safety and Security] and UNAMA [United Nations Assistance Mission in Afghanistan]. Have you been able to find out from them whether this February 2014 audit was the one that they’re citing now or is there a new audit? Spokesman Dujarric: I haven’t had a chance to actually follow-up but I will. Two day later, nothing. This is called stonewalling. Before publishing any of the documents, Inner City Press posed questions to five UNDP spokespeople. But none even confirmed receipt -- including Abdel-Rahman Ghandour, the spokesperson who belatedly responded to Inner City Press' previous LOTFA exclusives. What changed, other than Inner City Press' subsequent reporting on UNDP Administrator Helen Clark's layoff campaign, and these new troubling questions? The questions were sent on August 5 to the following, without response for 72 hours: lead spokesperson Dheepa Pandian (out of the office from August 1 to 18), Mila Rosenthal and Helen Clark's personal spokesperson Christina Lo Nigro. After Inner City Press asked UN Deputy Spokesperson Farhan Haq to reply about the UN Secretariat's own role, Haq on August 8 read a statement from UNDP -- there will be no answer pending a UNDP audit. Video here. This is pure stonewalling. And can Ban Ki-moon's UN Secretariat's Department of Safety and Security and UNAMA Mission hide behind a UNDP audit that may never be public? UN Deputy Spokesperson Haq: I was asked questions earlier this week about how the UN Development Programme (UNDP) is dealing with allegations in Afghanistan. UNDP informed me that it can confirm that recent allegations concerning Afghanistan have previously been reported to the UNDP Independent Office of Audit and Investigation. In order to avoid jeopardizing the investigation process, the details of investigations are kept confidential and very limited information is made available to offices outside the Office of Audit and Investigation, until the process of gathering relevant evidence and fact-finding has been completed. Should the matter be substantiated, the evidence gathered by the Office of Audit and Investigation will form the basis of remedial action. Inner City Press: Sure, I wanted to, after three days to say basically, that the UNDP is aware of the charges but won’t… one of the documents shows basically a threat by Afghanistan to UN staff. It says, you know, don’t make these allegations of corruption. 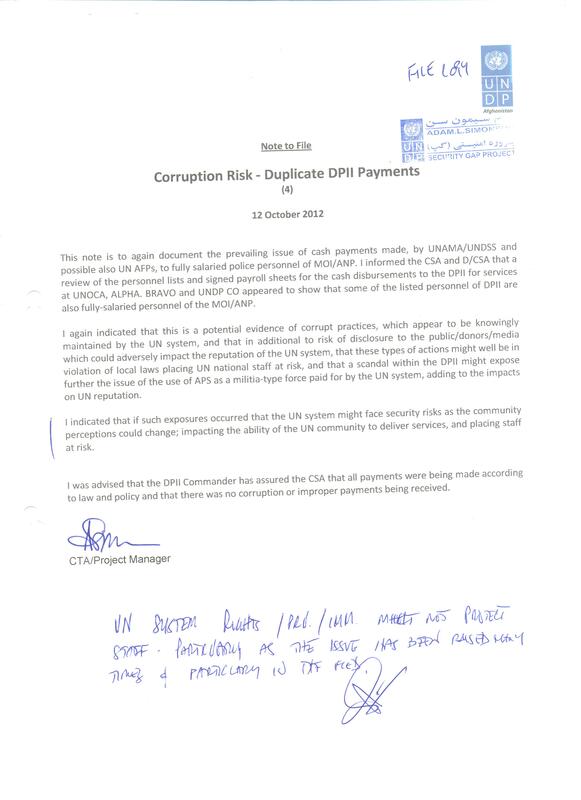 And so it seems like, it seems kind of imperative to… I wanted to know whether in response to the documents that have been published, UNDP provided any, either protection to the staff involved? I also wanted to know, I know that Helen Clark herself received a letter from the Office of the Special Investigator… of the Special Inspector General for Afghanistan Reconstruction in May, asking for a lot of information. I wanted to know, whether, I guess, UNDP will only answer through you, so I’ll ask you, because I e-mailed them these questions. I’ll ask you, did Helen Clark answer this… detailed request from a major donor or did she give the same answer, that UNDP is investigating itself? When will that investigation be finished? And will it be made public? Deputy Spokesperson: Well, first of all, as I think I just pointed out to you, this is subject to an audit. We’ll need to wait for that to proceed and the details of the investigation will be kept confidential while that investigation is proceeding. As I also said, should the matter be substantiated, the evidence gathered by the Office of Audit and Investigation will form the basis of remedial action. So that’s where we stand on that. If there are further details once this has proceeded from UNDP, either they will get in touch with you, or I will. Inner City Press: Did they answer CGIAR? Did they answer this? I’m starring at this pretty lengthy letter, detailed letter sent to Ms. Helen Clark. Did she answer questions from donor nations? Deputy Spokesperson: As you’re aware, because I just said it several times, this is all subject to an audit and, therefore, there won’t be any further details to provide at this stage while the audit is under way. Yes? After Haq refused another Inner City Press question, after the UNTV cameras turned off, Haq told Inner City Press that UNDP refused to answer the August 5 questions, below, due to "your people skills." Inner City Press deals perfectly well with numerous diplomats at the UN and many others -- but UNDP and some UN officials don't like hard questions and think they can simply stonewall, in the UN's Zone of Impunity. Seventy two hours in, while the UN Secretariat of Ban Ki-moon said it won't answer about the role of its own Department of Safety and Security and UNAMA mission while UNDP answers, August 6 and 7 video here -- UNDP had provided no answer at all. This despite UNDP Administrator Helen Clark having been subject to formal governmental requests about related UNDP irregularities in Afghanistan in May. Is this any way to run for UN Secretary General? Today's fourth document, exclusively published here, makes even more clear why Bann Ki-moon's Secretariat must respond. 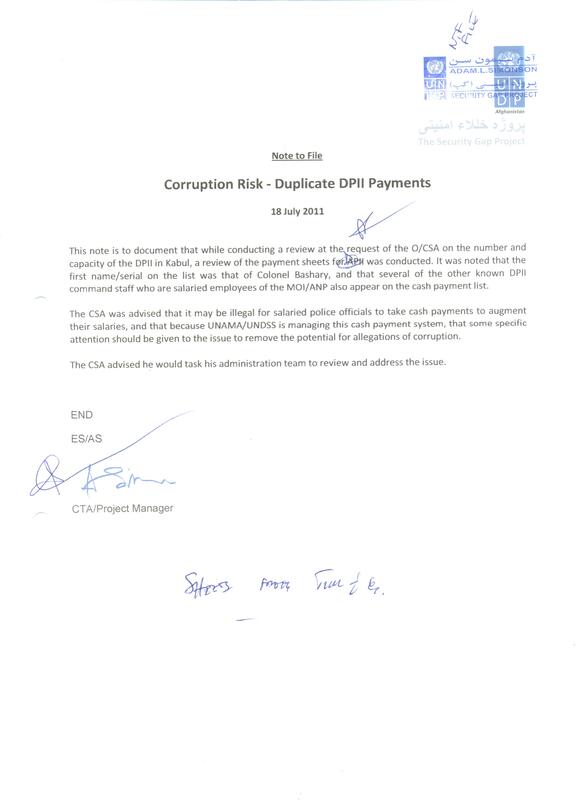 The document describes double payments then introduces one "Colonel Bashary," who threatens not to talk about corruption, "I will not tolerate these accusations." Click here to view. In Afghanistan as Inner City Press exclusively dug into, UN Security official Louis Maxwell was killed, presumptively by Afghan Forces -- and the UN has obtained zero accountability for this killed staff member. Inner City Press has put questions about Louis Maxwell to Deputy Secretary General Jan Eliasson, who to his credit responded, and to current Syria envoy Staffan de Mistura, here. Now: why would the UN be telling a whistle-blower to "just let it be," then refusing to answer? 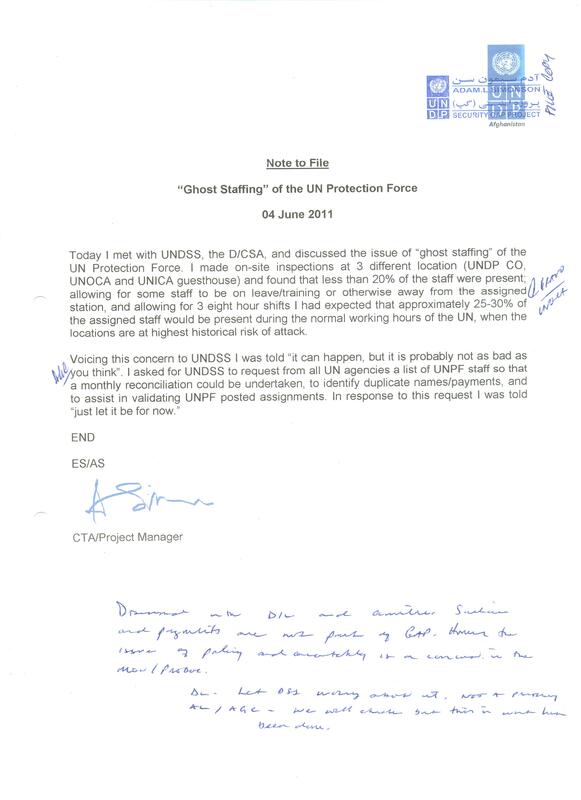 Yesterday's third document, exclusively published here, concerns "'Ghost Staffing' at the UN Protective Force," about which the UN Department of Safety and Security said, "Just let it be for now." Click here to view. 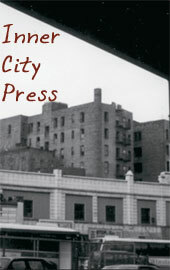 On August 5, Inner City Press exclusively published this one, linking it to the LOTFA scandal: an official "was again advised that it may be illegal for salaried police officials to take cash payments to augment their salaries" but the adviser was told it was "no longer my priority under LOTFA and that I was no longer to address these issues with DPII or DSS." Inner City Press on morning of August 5 asked no fewer than four spokespeople at UNDP, including the personal spokesperson for UNDP Administrator (and UNSG candidate) Helen Clark for their response to the below. More than 72 hours later -- there had been no answers. Inner City Press exclusively published the second document, here: about payments by UNAMA / UNDSS to fully salaried Afghan forces. Click here. Inner City Press: The payments by UNDSS (Department of Safety and Security) and UNAMA (United Nations Assistance Mission in Afghanistan) in Afghanistan to members of the Ministry of Interior and other Afghan forces that are already under full salary by the Government. Various documents have come out that show an internal UNDP (United Nations Development Programme) whistle blower seeking to raise these issues within UNDP because, I guess, because as the country team, or whatever. But the documents list, they name UNDSS, they name UNAMA, and basically the person was told, “Don’t raise this anymore.” So, I was anticipating you to say “Ask UNDP”. And I have more than 24 hours ago. I don’t have any answer from them. But I want to ask you, because the documents are not just about UNDP, but about DSS and UNAMA, is it… what are the rules? Is it UN’s, DPKO’s (Department of Peacekeeping Operations), DPA’s (Department of Political Affairs) and DSS’s understanding that Afghan forces shouldn’t receive out double payments. If this information came to light, I think it did, what was done about it? That’s my question to you. I don’t know if you get an answer today. Is it possible? Deputy Spokesman Haq: As I’m sure you’ve anticipated, and indeed you said you anticipated, yes, I’m aware that UN Development Programme is in touch with you on this. They’ve informed you that they will get back to you. And so, we will first have to wait for what their reply is. First ask them. Deputy Spokesman: No, no. It’s no use trying to get the two of us talk at cross purposes with each other. UNDP will get back to you. That UNDP "is in touch with you" was and is not true: there has been no response at all. The statement UNDP "will get to you" remains unfulfilled. This is today's UN system -- even when UN system staff unions wrote to Ban Ki-moon about Helen Clark, and Inner City Press repeated asked about the letter, there has been no response. 1. 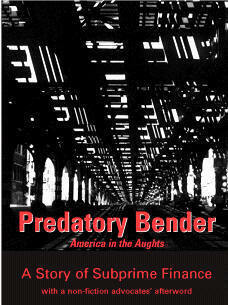 Lailuma Shirzad (procurement) - overstay in USA. On the visas we can for now add: There are 3 more from ELECT Project and 3 to 4 from Information Communications and Technology Unit whom whistleblowers say have also overstayed their visas. No answers from UNDP. We plan to have more. Watch this site.